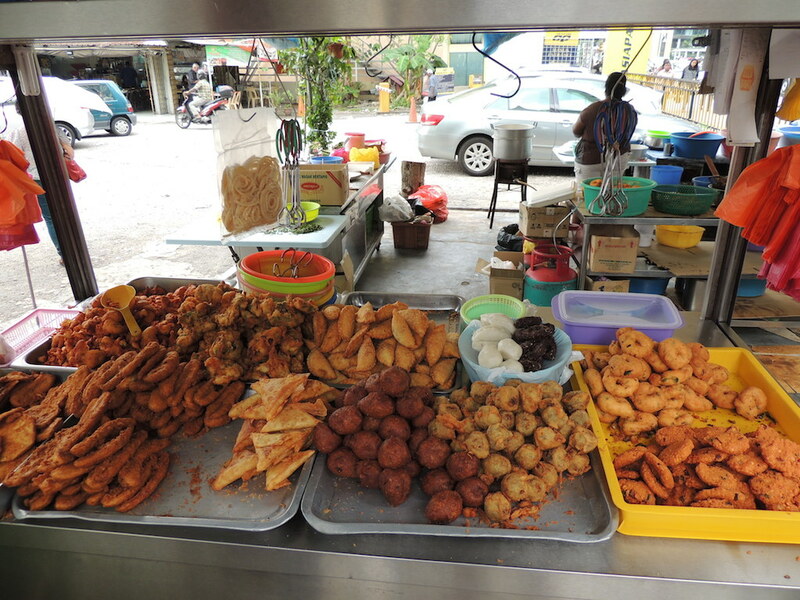 Kuala Lumpar Food Safari – These Two Eyes! “Today is about a group of friends eating and sharing stories,” said Carlson from Urban Adventures upon greeting us at Bangsar Station LRT to begin our 4-hour walking tour amongst the best local street food Kuala Lumpur has to offer. In fact, Carlson would argue he took us to the “best of the best” and it is the only true walking tour in KL. I wouldn’t argue my day spent in the River City exploring the stimulating flavors of this Chinese, Indian and Malay melting pot was a highlight. 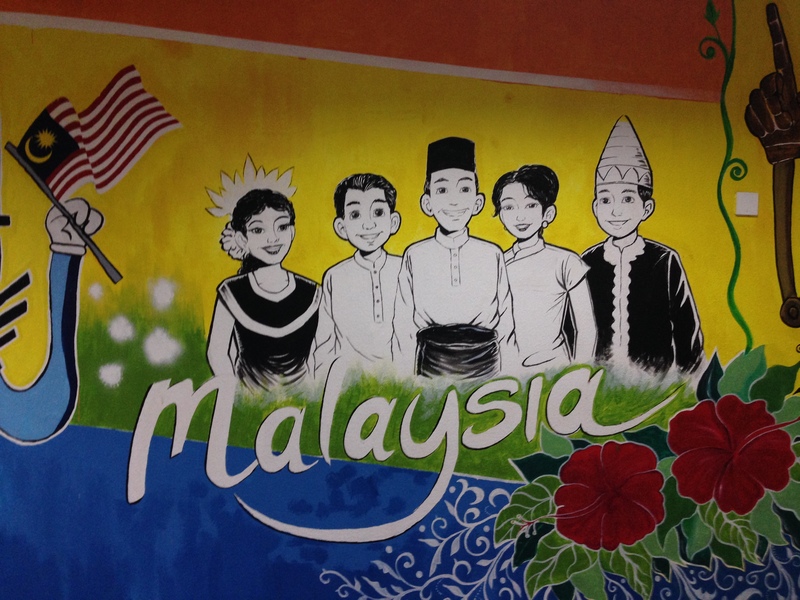 We began by walking through the residential Indian-influenced community of Brickfields and were told the history of the area while stopping to look at a traditional Brickfield home, a 75 year-old Muslim cemetery and Garland Alley, where fresh, fragrant jasmine from the Cameron Highlands is used for temples and offerings. Just the ladies from our small group of 7 were given a beautiful, colorful bracelet to wear. Tarani Food Corner, our first official food stop and hands down my favorite of the day is small and family owned. The wife serves while the husband is the chef. We sat amongst the locals while rotating fans spraying mist provided a welcoming escape from the humidity. On banana leafs we ate with our right hand, mixing rice, spicy chicken masala, tangy mango pickles, lentil curry, and cabbage while using our thumb to spoon it into our mouths. We then finished it of with resam, a traditional Indian digestive. I left feeling overwhelmingly full unaware that was only our first dish out of 6 for the day. Immediately following we stopped at a roadside vadai stall, which offered a variety of vegetarian fried treats. 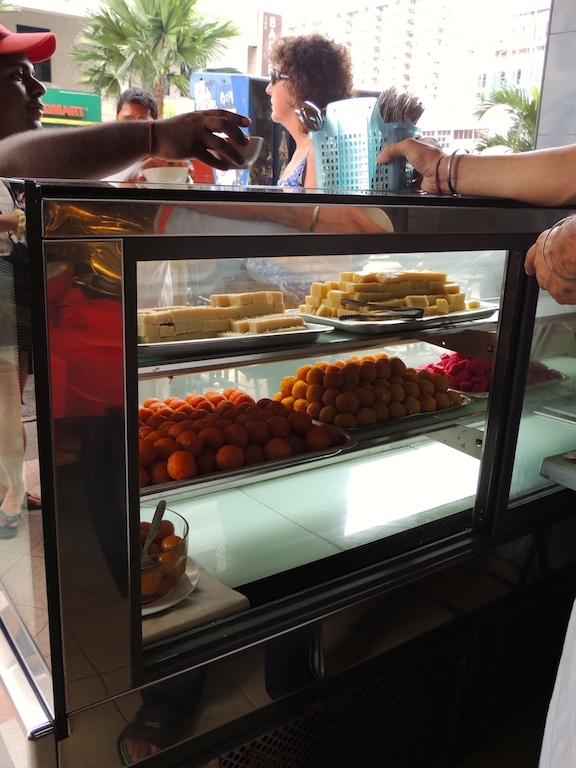 Most popular were lentil donuts, curry puffs with potato masala and of course, the undeniably awesome fried banana fritters. The donuts made from rice flour contain chili curry leaves, which are eaten to prevent grey hairs. Continuing along we transitioned to the commercial side of what is known as Little India 2. We learned that this community, popular with Hindu’s, is rather new. It’s only been on the radar from 2007 and is often overshadowed by the original Little India, which is more Muslim dominant. However, our next treat was super sickly sweet. Gulap Jamun is a sticky syrup dessert ball. I was so full; I couldn’t even finish the bite size indulgence. While walking through the equivalent of the ‘red light district’ we were told to look out for “special people,” although Carlson wouldn’t immediately tell us what to spot. Pimps lined the streets, each sitting on a chair protecting their open door, but they were not the special people he was referring to. We stopped on a busy street corner where locals lined up to get a serve of cendol, the cool shaved ice dessert. An older woman served the shaved ice with coconut milk and plum sugar topped off with green rice jelly that looked like worms making the super sweet, yet refreshing treat popular with adults and children. The man then took his machete and in a few swift moves opened a coconut shell turning it into a revitalizing drink served out of a plastic bag. While our group relaxed consuming the celebrated 52-year-old cendol recipe we finally identified the special people Carlson was referring to. The blind and disabled from all over Malaysia come to Brickfields for jobs. The Urut Tradisional PB Blind Massage, owned by Paralympic athletes, provides training and job opportunities within the local community and the most common is blind massage. It’s pretty awesome when you think about it. Just across the road were the “best banana fritters in all of KL.” For 35 years the father and son team have been dishing out the famed “secret recipe” at this popular roadside stand. In fact, Carlson tells us they are doing so well that they both own 5-series BMW’s. Not too bad for a simple banana business. At that point we fortunately had a quick break to use the clean bathrooms in KL Sentral before hopping the LRT to Pasar Seni LRT Station for our next and final stop, Chinatown. 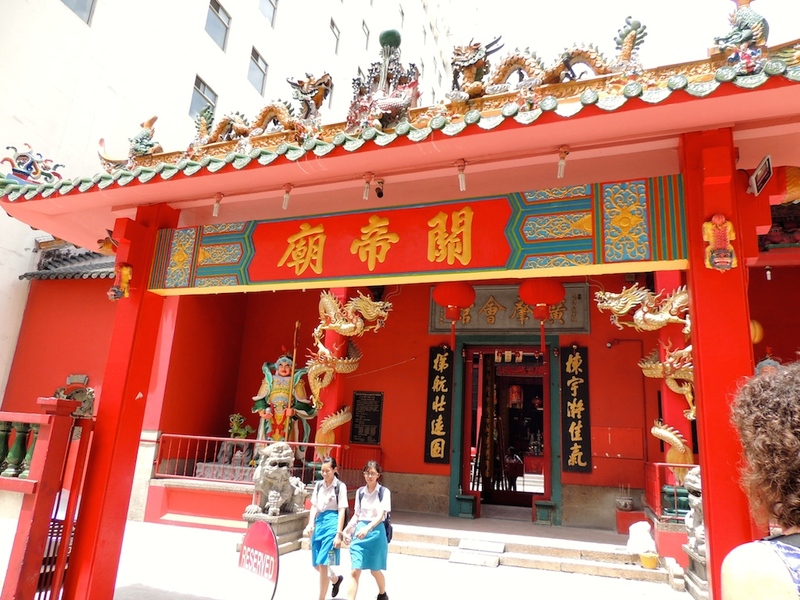 We spent a few minutes admiring a 125-year-old Taoist warrior temple and patted the lions out front for good luck before navigating the stalls of knock off bags, jewelry and watches in Jalan Petaling Market. Over our final meal, which I had barely enough room left in me for, Carlson shared some of his personal stories. When he’s not helping his uncle with the business part time he studies law. But certain aspects of the food tour have taken its toll. He went from 68K to 122K in just four months and has since refrained from dining with his guests. That is until this last stop. It was a fairly popular place in the heart of the action, likely considering it’s one of the few in Chinatown with air-conditioning. Then again, it’s also been around for over 60 years and known for its hokkain noodles, which of course we got. We then tried a huge range of dishes, from the pow (pork bun) to fried egg yoke noodles, penang char keuh teow served on a banana leaf and it was super yum to spicy Chinese laksa and low si fun, or what locals call rat tail noodles. It didn’t seem to stop. On the side we drank lime juice with sweet plums and cold Chinese tea. Even more, Carlson was so encouraging, happy to order more and more and let us try whatever ticked our fancy. Our bellies were so full that we wished the gang safe travels and fortunately were in walking distance to our accommodation. Unfortunately, despite being close by, we didn’t manage to beat the daily afternoon rain shower. I would totally recommend this tour to anyone visiting KL. Carlson was friendly, affable and interesting. The tour was contained to a small group and personalized to our needs. They clearly have a daily spending budget so if you want a bottle of water or an extra serve of anything throughout the day it’s catered for. Despite our bellies being maxed out we had a reservation that evening for fine dining at Fuego, part of Trioka Sky Dining. A bit heftier on the wallet than our budget courses that afternoon, Fuego is an open air restaurant on the 23rd floor specializing in South American cuisine. Yes, the food, service and drinks were all standout but the best part was the view, situated just across from the iconic Petronas Towers. The 6:30 seating is ideal for catching the magnificent towers by day, at sunset and dusk. I would totally eat there again and again. There is a moral to this food driven story. If you are hungry, go to KL. You won’t be disappointed.